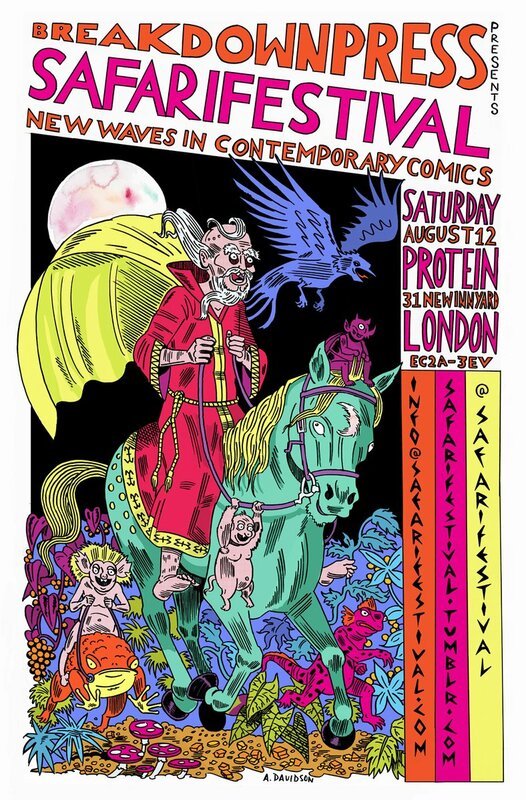 I’ve probably expressed similar sentiments before at Broken Frontier over the years but for those about to discover micropublisher 2dcloud for the very first time at this year’s Safari Festival these thoughts bear repeating. 2dcloud don’t just push the boundaries of what comics can be as much as redefine, re-evaluate and sometimes even break them. The work they publish ranges from more familiar sequential panel-to-panel storytelling through to minimalist, abstract narratives. 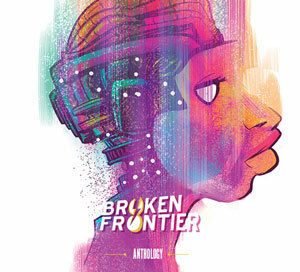 The one constant throughline though is that their books always inspire the reader with the vast and unique possibilities of this medium and challenge us to broaden our preconceptions of what the form is. 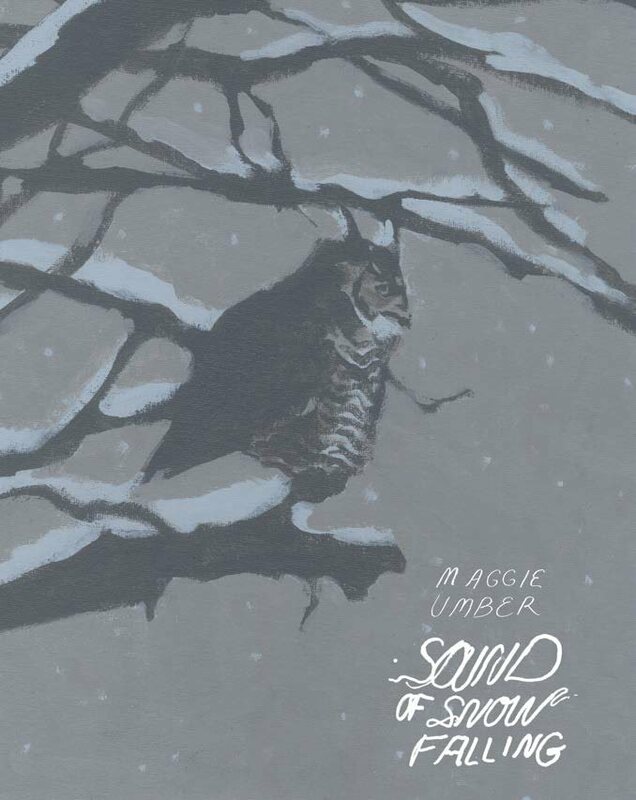 On a first glance Maggie Umber’s Sound of Snow Falling appears to fit into a traditional panelled storytelling mould but this account of the lives of a mating pair of Great Horned Owls subtly manipulates the form to bring us directly into their environment and to experience it on the same primal level that they do. 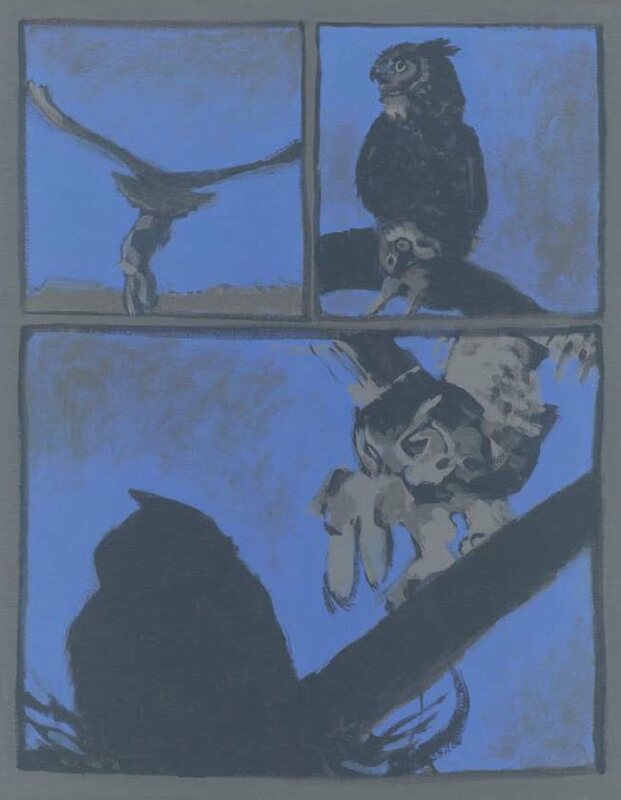 The book follows not just the two owls themselves across the seasons – through courtship, nesting rituals and the birth of their offspring – but also puts their exploits into the wider context of the wildlife around them. This is an entirely wordless affair. 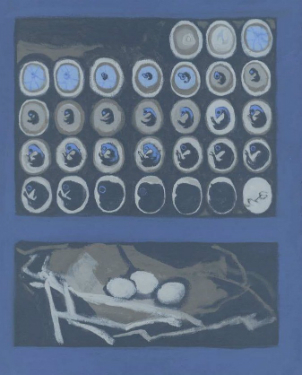 There’s no need for unnecessary exposition here as Umber’s subtle but expressive visuals tell us all we need to know. This silence emphasises the reader’s role as observer, always that one step back from a world we can never truly be a participant in. And yet it still allows us to immerse ourselves within this realm but without the projection of our own human foibles onto the avian protagonists. The gorgeous painted art recreates a nocturnal habitat that is almost eerie and alien in its hazy realism. Colour is muted and subdued as a result, giving Sound of Snow Falling’s pages a highly atmospheric charge. In these environs time is not even an abstract entity but, rather, indistinct and mutable in its flow as Umber utilises that “reading between the panels” ideal of the form to great effect. Weeks can pass between pages but at other times whole expanses of time can be concentrated in a single panel, most notably perhaps in the depiction of an owl chick gestating within an egg. 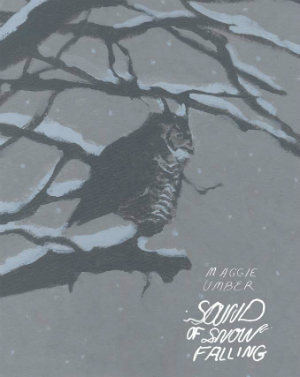 Essentially Sound of Snow Falling provides a series of vignettes into the owls’ lives over the seasons that are seamlessly sewn into a whole. It’s a beautifully realised study with an accessible appeal but also one that exploits the specific storytelling tricks of comics to give a unique insight into the lives of these birds. Ultimately there are parallels to the human world and our own cycles of reproduction and nurturing here and yet Umber reminds us throughout Sound of Snow Falling that while these creatures’ existences may be observable and understandable they are on some fundamental and vital level also unknowable. An utterly captivating foray into the natural world that should definitely be on your “must-buy” lists at Safari Festival this weekend. Sound of Snow Falling is published by 2dcloud whose site and online store can be found here. You can follow Maggie Umber on Twitter here and 2dcloud here. 2dcloud are exhibiting at Safari Festival on August 12th.